The Motorola Milestone goes live on Telus today. I’ve been playing with one for about about a week now. It’s a great device, as others have described the Droid as posing a “more significant challenge to the iPhone than any other phone to date”. The Milestone is the HSPA/UTMS/GSM version of the Droid. The dock and the Alarm Clock app are cool but it’s just a dock, not a deal breaker for me. Network Unlocked – Whether this was intentional or a feature of a pre-release phone, I just popped out the Telus SIM card, stuck in my Rogers card and I was good to go. With Fring/Skype and Google Voice I’m pretty much up and running anywhere. Speed – The tradeoff for battery life, is speed. This thing is a speed demon. Network fast. Processor fast. Everything but the camera was fast. Google integration – This is either a like or a dislike. If you believe in a Skynet like future, having the GOOG on a device that integrates with their services and with my location scares me. Contacts, Mail, Calendar, Voice, Sky, etc. All executed very, very well. Soft keyboard – I’m hoping to try out Swype at some point, but the soft keyboard is pretty good. I find the auto-correction less intrusive than the iPhone. I was also surprised how little I use the physical keyboard. I only use the keyboard when in landscape mode. Landscape mode – It’s great to have the entire screen real estate in landscape mode. While the physical keyboard isn’t a must have feature, it is very nice to see everything on the screen when banging out a long email. Battery life – I only get about 3/4 of a day under heavy usage. This might be a feature of all 3G phones but it feels like I need to bring the USB->micro-USB cable and charger with me every where. Given that I’m comparing it to a Palm 750wx (with 3G modem disabled) and an iPhone 2G the battery life is appalling. Unlock button – You press the power button in the top right corner to bring up the unlock screen. It’s just an interaction design nightmare. I can’ hold the phone in one hand and press the big home button like on my iPhone and sweep across using the gorgeous gesture unlock. Industrial feel – The iPhone feels like a piece of nature. Like a comfortable stone shaped by water to fit in your palm. The Milestone has a much more industrial feel. Hard edges, sharp lines, metal and glass. It’s a beautiful device that feels great but it’s harder. Physical keyboard – It’s a little cheap. It takes some getting used to. I had though this was going to be something like the HTC TyTN that was a selling feature for me. However, while it is a nice to have, it’s is not a must have feature. I think the iPhone has taught me how to be very effective using a soft keyboard. Background processes – I feel like a Unix administrator always running “ps aux” trying to figure out who is using memory, battery and other resources. Even with task killers, I just want my OS to effectively do the memory management for me. It’s still way too low level and nerdy. I want the simplicity of the iPhone where the OS manages it for me. Camera speed – The camera is slow! The pictures are fine. But it’s like going backwards 7 years in terms of speed. I missed every picture of the little ones at a birthday over the weekend because the camera would stutter and then take a pic 100-500 msec slower than I was expecting. The Milestone is a great device. It’s a worth competitor to the iPhone. 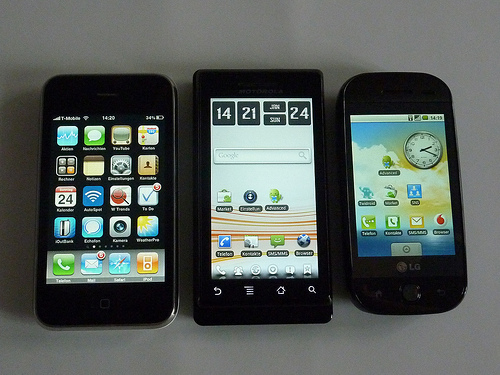 I’m interested to see the newest generations of HTC devices running both Android and the Windows Phone 7 Series. However, in the meantime, the Milestone is a great experience. Another day, another new s,art phone. Take a look at the new HTC Legend that they unveiled today. Looks absolutely gorgeous, runs Adnroid 2.1 with multi-touch, optical trackpad, etc. I think this one is worth waiting for: http://www.engadget.com/2010/02/16/htc-legend-h…. RIM better get its innovation hat on quick (how's that Torch Mobile integration coming along?) or it's going to be left behind. MSFT, Google, Apple, Palm and HTC (on the device/software side) are out innovating RIM at every turn. I'm an HTC fanboy. I had a DooPod c730 that was a great device. And I'm drooling over the HTC HD2, but the biggest challenge has always been with availability in Canada. And as much as I love Expansys, I don't like having to pay a premium to get access to hardware. Made worse by the fact that it's Mobile World Congress week.